The 3rd day of the Sierra Challenge had us going deep into the Ansel Adams Wilderness, behind the main crest of the Ritter Range to the 11,000-foot summit of Mt. Bartholomew. The peak was unofficially named for Orland Bartholomew who had made an incredible winter traverse of the High Sierra on skis in 1929, solo. 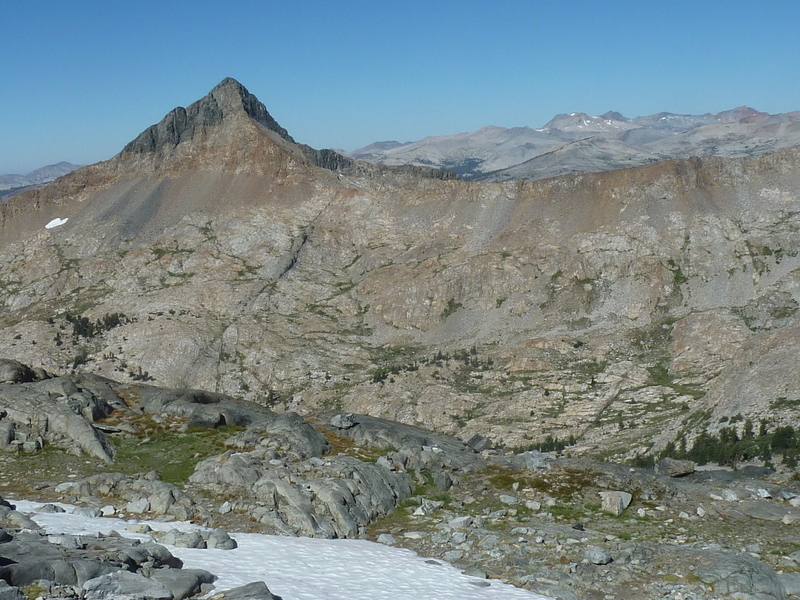 The peak stands tall and almost alone in the Ansel Adams backcountry, with more than 600ft of prominence as it overlooks Iron Creek and the South Fork of the San Joaquin River. Our route would utilize the Beck Lakes Trail, one we hadn't used in previous Challenges. We had 21 folks for the 6a start out of Devils Postpile, all but 4-5 heading to Bartholomew, the others heading to the SPS-listed Iron Mtn. We were not long in plying the well-used trail through Devils Postpile and crossing the bridge over the San Joaquin River. We were still in a large group as we reached the second fork, everyone following the leaders to the left. In the back with a few others, I paused when Michael commented, "I think we were supposed to take the Minaret Falls Trail." The others were following those bound for Iron Mtn and weren't paying all that much attention. We watched the majority in front of us go out of view while we confirmed Michael's suspicion, then four of us turning back and taking the correct trail. The tactical blunder would not be noticed by the front group for another mile when Eric figured out the mistake and turned the others around. It was a costly mistake on what was already going to be a long day. Meanwhile, Ken, Michael, Mason and myself headed up the correct route towards Beck Lakes. Rob H, who had been futzing with his hydration pack and was dead last leaving the TH, took the correct course at the junction had ended up in front of everyone without even realizing it. For hours he wondered how it was that he hadn't caught up yet with any stragglers and had seen no one all morning. The four of us reached Beck Lakes by 8:30a, by which time Eric had caught himself back up with the front group. He had had to jog much of it to catch us, something the others weren't able or wanting to do. The lakes are nestled in a steep-walled glacier cirque on the east side of the crest, the trail ending just before reaching the lakes. While four of us headed right, aiming for the crest, Eric went left to tag two bonus peaks south of Beck Lakes, Peak 10,663ft and Peak 10,997ft. The first of these he reported as straightforward class 2, the other with some loose class 3 to contend with. While he was off chasing these, we found our choice of route over the crest a good one. After traversing the north side of the first lake, we reached the westernmost lake and began an upward traverse towards the saddle west of The Watchtower, finding class 2 on both sides with some very fine grassy slopes to take the sting out of what could have been a horrendous talus/boulder slog. I finally caught up with Rob H at the crest at 9:30a and the two of us went over the other side into the Iron Creek drainage. Mt. Bartholomew came into view about 5min off the crest and it looks quite imposing, rising in a striking manner at the end of a ridgeline extending southwest from Michael Minaret. We had hoped to climb the NE Ridge since it was the shortest approach, but this proved impractical as it drops precipitously from the summit and is almost certainly class 5. Instead, we dropped 1,500ft to Iron Creek before ascending the other side and traversing high across the east side of Bartholomew over a disagreeable boulder-fest. We eventually found a class 2 chute leading up to the SE Ridge, and from there it was more boulders and talus, but all class 2 to the summit. It took Rob and I 5hr15min to reach the summit with a commanding view of the backsides of the Minarets and Mt. Ritter to the north, the Clark Range and SE Yosemite to the west, the higher peaks of the Sierra to the east and southeast, and an unusual vantage of the San Joaquin's North Fork drainage to the south. Michael joined us about 10min later, making three for the summit shot. A register we found dated back only a year, left by a Gabriel Dumont on a bow hunting trip. We were already starting down the ridge about 20min later when we came across a number of the others in succession. Eric, Mason, Sean, Chris, Iris and Gavin were all heading up, spread out over about half an hour's time. The next person we saw was David P back at Beck Lakes - he had gotten to the crest but decided to turn around. Some of the others heading to the summit - Ken Y, Matt Y, Scott B, we never saw, but suspect they had passed us undetected over those last few miles. In crossing back over the Iron Creek drainage, we found a far less tedious route on the return, even if it involved dropping a bit further down in elevation. Rob and I got separated in here somewhere as we pursued slightly different courses, but eventually regrouped back at the pass. Jersey Strategy: Scott continued his run for the Polka Dot Jersey with an additional 4 bonus peaks today. He started by climbed Red Top, then the two unnamed peaks south of Beck Lakes, then after climbing Bartholomew he talked four others into joining him for Starr Minaret. This group was out for an exhausting 15hrs, not returning until after dark. I don't actually remember how Chris and I started talking about Starr Minaret. I had mapped it out (and many others that I had neither the skill nor endurance to do) beforehand, and I *think* we were talking about it prior to Day 3, but I can't recall. However it happened, it was an awesome day. One of the many things Chris had mentioned enjoying about the Challenge is finding random people in the middle of nowhere at a much higher frequency than one usually might expect to. I think Starr Minaret got more action that day than it's had for quite some time. Though as there was no register, who knows. I do know that as I topped out on the summit, having seen nor heard the others I had hoped might be heading there, I had figured they declined a visit. Then maybe 10 feet from the summit I suddenly heard and saw them, just as they were a few minutes from leaving. The whole thing was definitely Sierra Challenge Awesomeness, though. Great day.